Through the hard work and devotion of students and staff, the organization Paralyzed Veterans of America Florida Chapter will be given a check at the Veterans Appreciation football game, against Coral Glades High on Nov. 9, to aid soldiers that fought for the country. “It’s just a way for us as a school to say thank you to the veterans,” JROTC instructor Lt. Col. Johnson said. 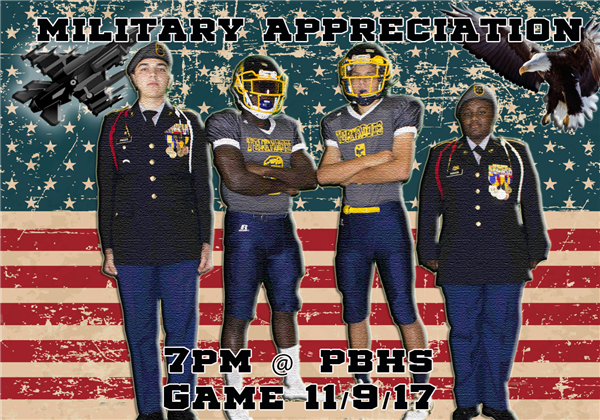 The game was rescheduled because of Hurricane Irma and will now be held on the same day as JROTC’s Fallen Heroes ceremony. “(The Fallen Heroes Ceremony) is our tribute to Veterans Day, so it’s appropriate and makes it special,” Johnson said. At the game, military veterans will be applauded by everyone in the stadium. “They stand up in the crowd and ‘Thank you!,’” Johnson said while demonstrating the applause the crowd will give. The organization has been invited to the Veterans Appreciation Game in previous years. JROTC has provided the organization with services such as Color Guard. The organization once provided funds for students to go on a trip to Poland. The students were able to explore multiple museums and memorials in order for them to experience and learn more about history. Donating to this cause impacts the institution and the students giving. “The student body would have an eye-opening experience and understand how we kind of take things for granted and how we wake up like, ‘Oh we’re free!’ but we sometimes don’t realize that we are being fought for,” Garnes said. Nicole Canino, a freshman, enthusiastically donated money when she first heard of this event from her personalization teacher. She was excited that she could help a foundation, such as this, in her first year and shared the information she knew about the cause to her classmates, in hope that they would also donate. She said that at her previous school, opportunities like this were very limited. “Since I’m so young I feel like there are not a lot of ways to contribute to society, but I feel like this event gave me an opportunity to,” Canino said. Canino and Garnes both fear that not enough students are aware of the game and the donation. “I would like to go out again, when we get closer, to try and get more—make it a nicer donation,” Johnson said.